Fab-Seal Industrial Liners, Inc., has been an industry leader of flexible PVC liner systems and accessories, including turnkey liners installed by an experienced and factory trained crew. Fab-Seal has over 30 years of experience manufacturing and installing the best PVC liners for both primary and secondary containment and we provide turnkey liners to simplify the process. Call 800-874-0166 now for more information on how Fab-Seal Industrial Liners, Inc., can supply your PVC liner needs with turnkey liners that come complete with installation. Fab-Seal Industrial Liners, Inc., maintains a large inventory of PVC Flexible Membrane Liner Materials, with a blend and thickness for most applications, from a large industrial storage tank to a small liner for a backyard fish pond. 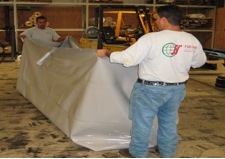 No job is too large or too small for the industry professionals at Fab-Seal. With turnkey liners from the industrial professionals at Fab-Seal Industrial Liners, Inc., you will save on installation, down time and the premature applied coating failure costs. Fab-Seal's internal liners are mechanically held and become the primary containment with the tank becoming the secondary containment. Fab-Seal’s factory trained and OHSA compliant installation crews will reduce production loss by putting your turnkey liners in place in a matter of days. Your tank piping can be integrated into our turnkey liners using a flat-faced flanging system. The industry experts at Fab-Seal have PVC liner solutions for a large variety of industrial applications. Our turnkey tank liners are built to resist water, oil, alcohols and household detergents. 800-874-0166 today and find out how the industry professionals at Fab-Seal Industrial Liners, Inc., can supply and install turnkey liners for your specific application or job. Or simply fill out the contact form to the right and one of our knowledgeable representatives will respond shortly.